I started TwinsMommy back in March as a way to blog some more – because I just love blogging  – and engaging with a new audience. It wasn’t until about a few weeks later – in April – that I really wanted to grow this blog. Psst.. I made some money from this site! Read on to find out more. This is my first official summer as a blogger so the whole “summer slump” is fairly new to me. On my freelance writing website I always have client work each month, so I don’t take a dip in my income, but with this blog, my focus is growth right now and not income…yet. And I did encounter a dip mid July, but overall, my blog continues to grow…albeit at a snail’s pace for now. There wasn’t such a huge increase – only around 11% growth for July. I can only assume it’s because summer is here and everyone – including me – is outside enjoying the nice weather. Generate 25k pageviews – FAIL. This is the second time I’ve made this goal and I still haven’t gotten that close. I feel 25k pageviews isn’t a huge jump from where I was last month (18k pageviews), but it just wasn’t in the cards this month. Increase my daily visitors from 450 to 600+ a day – I actually was averaging around 600-700 visitors a day until mid July when the slump hit me! Keep continuing to provide useful and epic blog posts of at least 1k words twice a week – Success pretty much. I published 7 posts in July, which is close to my 2 posts a week goal. I had one post that had over 1k in shares – which helped me grow my list because of my content upgrade in that post. This last month has been focusing on diversifying my traffic. This is one way I’m trying to beat the summer slump but also because if you don’t know, most of my traffic is from Pinterest. 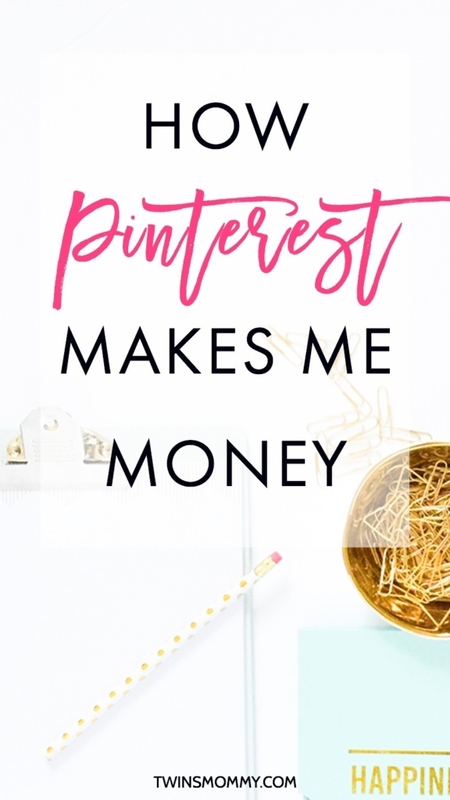 My number one way a visitor on Pinterest comes to my site is via this post.I don’t know about you, but I don’t like knowing that the bulk of my traffic comes from one source. What happens if Pinterest changes everything? Or my account gets banned? You never know right? So, I’ve been exploring other sources of traffic to help alleviate this issue. I’ve always used Twitter for my freelance writing service. In fact, it’s helped me land high-profile gigs and has generated thousands of dollars for me. So, before I started TwinsMommy I had a fairly decent following (over 1k Twitter followers). Since I’m sharing my Twitter account with both my blogs, I made a new banner. I then started learning more about IFTTT – an automating tool. It stands for, If This Then That and helps you automate pretty much anything you want in regards to your blogging and social media. You create recipes of, “If x, Then x” and link certain apps together like Buffer and WordPress or Twitter and Facebook. I first got wind of this app from none other than Melyssa Griffin in one of her free webinars. She created a recipe that I used to link Buffer to my Google Calendar and now I schedule my tweets and repeat them. Any new tweets I want to add, can be added via Google Calendar. I also read Suzi’s post on using IFTTT and Twitter. So, now I have both recipes going. This is all free by the way and it seems to be working. Here’s my Google calendar to see my scheduled posts for Twitter . It’s still a work in progress as I’m finding sometimes IFTTT and Buffer tweet out the same post at the same time so my feed has dupes. I’m on Instagram – well I have been since I started Twins Mommy but just started using it this month! I have no clue what I’m doing but I’m having fun! I’m only posting marketing posts like Instagram graphics or graphics of my posts. I’m also still understanding the whole hashtagging concept and how to write a caption. Right now I’m just using the introduction in my blog post as my caption and littering it with hashtags for my Instagram posting. I don’t use my phone much, now that I work from home and I don’t carry my phone around much, so posting to Instagram was a struggle until I found out about Grum. Grum allows you to post on Instagram from your computer. I’m so old school but I just can’t figure out how to upload an image of my blog post from my phone without doing a ba-jillion steps. It’s super easy to use. You just drop your blog post image and write a caption for it. Then you can post it right then or schedule it. I found out about it as a SumoMe deal and even SumoMe uses Grum! Right now I’m having fun learning how to use Instagram to drive traffic to my blog. I Started Making Money on This Blog! Setting up an affiliate account took forever. Right now I’m an affiliate for Tailwind, and I am generating income! Yay! The commission is super duper small, but I’m happy with generating ANY income. So I’ll start posting my income report, but I have a feeling it will be slow for a while as I start to decide what affiliate programs I want to sign-up for. So, currently, any income reports will be from income earned only. I’ll also include my expenses that are related to Twins Mommy and not my other blogs. This income only includes money generated from Twins Mommy. It does not include my freelance writing service, course sales, coaching clients and writing clients. This does not include my hosting fees, which would be about $10/month because Twins Mommy is hosted with my other sites on a cloud server. So I didn’t come out ahead, but it’s something right? I just put my affiliate link in some popular posts and that’s it. Since affiliate marketing isn’t my goal for this blog, it won’t be my area of focus, but I do want to share what income I am earning from this blog. I have been approached by various brands to do sponsored posts so I may do a sponsored post as long as it fits with my goal for this blog. Start looking at SEO strategies – I really need to up my game with SEO but I know backlinks are key to really making your blog take off. Diversify my traffic source – I want to start promoting more on Twitter and Instagram. Consider doing a sponsored post. Yay! I have gained 1k followers in one month! Last month I had 2.5k followers. This month I have 3.5k followers! I’m so happy that I continue to gain more and more followers every week. Last month I almost gained 1k followers and this month I finally have. It isn’t a huge jump, but I’m still super excited for the growth! I know having lots of followers doesn’t mean more traffic back to my blog. My average monthly viewers tells me how big of a reach my pins are generating. 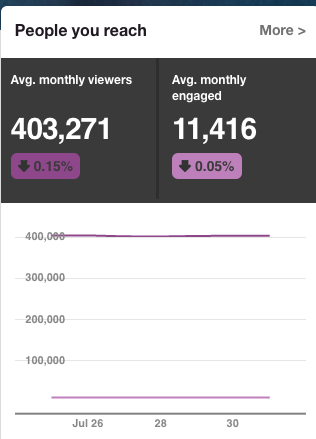 Last month I had 324,00 viewers. And this month? Not bad! Like I said, the summer slump has come to me but I’m trying to fight it hard! 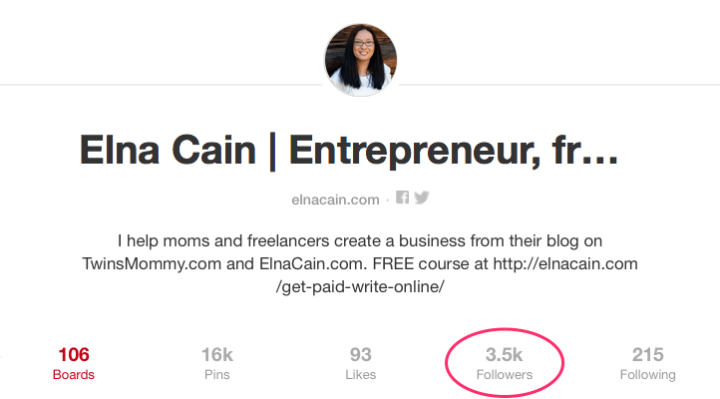 Generate 500,000 monthly viewers on Pinterest – FAIL. Not quite there yet. Have around 4k followers – FAIL. Move to pinning 200+ a day (80% mine/20% others) – Success. Starting July 1st (to account for the summer slump) I upped my pinning strategy from around 130-150 pins a day to 200 pins a day. 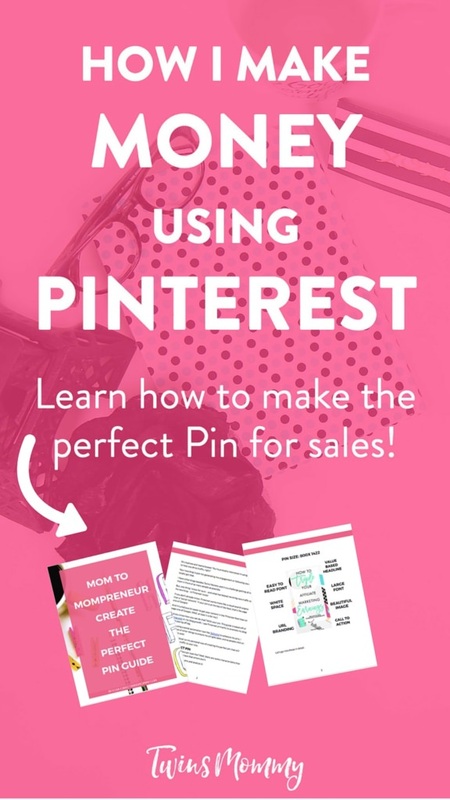 One of the biggest things I did was increase my pinning from 130 to 200 pins a day. This might seem like a lot and it is, so I’m not sure how long I can sustain this. I don’t do this manually! I use Tailwind to automate my pins so my strategy has been on auto pilot for most of the month. About twice a month I have to re-schedule my pins in Tailwind and that takes around 15-20 minutes. It’s a bit more time consuming than before, but since I’m pinning more, I have to schedule more. As I mentioned before I don’t want to rely so much on Pinterest, but I’m still using it to market my blogs. Besides increasing my pinning strategy, I’ve also started creating new pins for my popular posts as another way to fight the summer slump! I’m using a complete new look with a new font, branding style, new headlines and a new graphic for my incentivize graphic. Right now both new pins are generating repins and this is something I want to continue to do for popular pins. I’m hoping these “new pin” looks will reach more people and help bring more traffic to my blog. Monitor my new pinning strategy of 200 pins a day and if no huge change in my traffic, will go back down to around 130 pins a day. 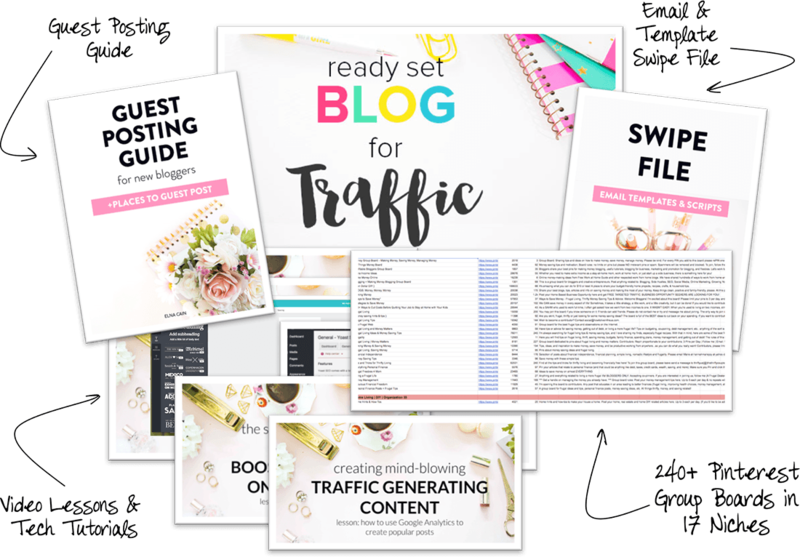 Growing my list is just fun and I love coming up with new freebies – also called content upgrades – for my visitors. Last month I had 643 subscribers. And this month? I gained over 270 new subscribers in one month! And that’s just from using content upgrades. Content upgrades are awesome to grow your email list and I will continue to use them. But, what about a lead magnet? If you’re unsure what that is, it’s a freebie you offer to your visitors. But this is your main freebie on your site. Well, I finally have one up! It’s a resource library with my webinar (and soon more webinars), guides, checklists and anything else I end up creating. 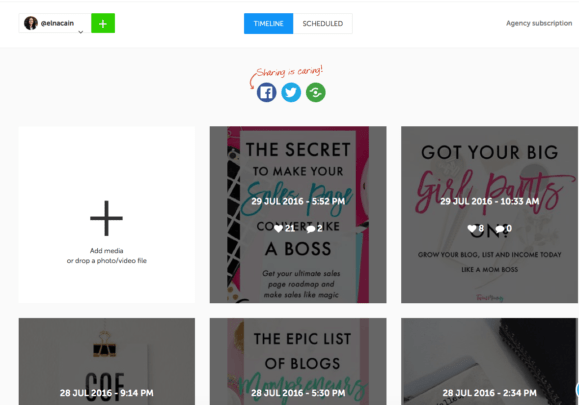 I’m calling it the Mom Boss Vault as I want to tailor my content to moms who want to become mompreneurs. If you’re a mom and want to grow your blog and biz then my resource library can totally help you out! How Did I Do With My Goals? I’m going to roll out a Welcome email series for those who subscribe to my list – Success. It’s been rolled out and people are going through it. I’m happy that I finally have a welcome series for my blog. I’ve never had one on any of my other blogs so figuring out how to do one and what to include was something I checked out last month. It’s five emails and while a new subscriber is going through the automation, they aren’t notified of my weekly newsletter until they are finished with the welcome series. Since I’m not promoting anything, there’s no point for a subscriber to get get a ton of emails from me! Create more webinars – I’m in the works of doing up to three webinars with other bloggers and can’t wait to spill the beans on these projects (one of them I will this week!). Get ready for an epic giveaway – Yes, I will be doing a massive giveaway hopefully in September. I will give away courses and guides to help moms become mompreneurs and I can’t wait to tell everyone about it! Generate 500 new subscribers. Yikes! Big goal here! I’m hoping with a webinar and my resource library that I’ll be able to get 500 subscribers to my list. Guess what? I have a Blab with Dre Beltrami from the Branded Solopreneur! It was scheduled on August 9th, but now it’s changed. Will keep you notified when this occurs! 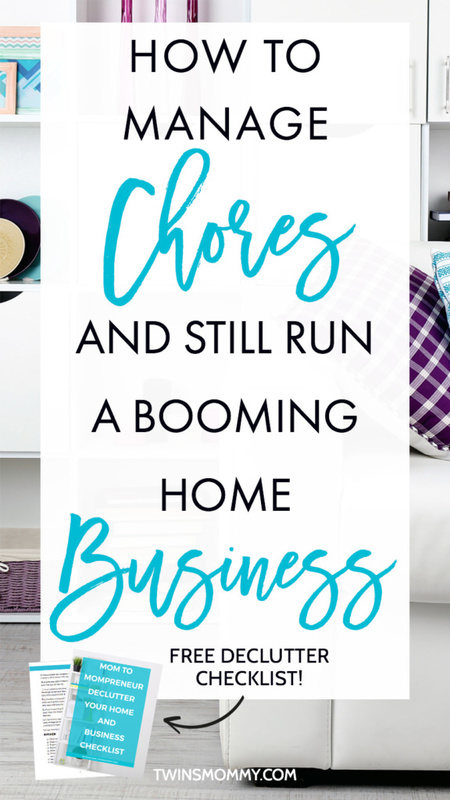 I’ll be talking about being a mompreneur so make sure to check that out! And as I’ve mentioned, I’ve been approached by some brands to do sponsored posts so I’ll look into that for next month. But other than that, I’ve been trying harder to comment on other mama’s blogs, share their posts and connect with more moms. What about last month’s goals? Well, I didn’t set any and actually took a pause. Participate more in Facebook groups like the Dear Mom community group. This is always a concern for me. I’m not out of the summer slump so I can only see what August brings me. I still want to create posts that will help other moms and even feature them too! I also am tickled pink that other bloggers are featuring me or mentioning me in their blog posts. Thank you so much! I can’t wait to see how my blog, email list and now my income will grow! So, are you with me mamas? 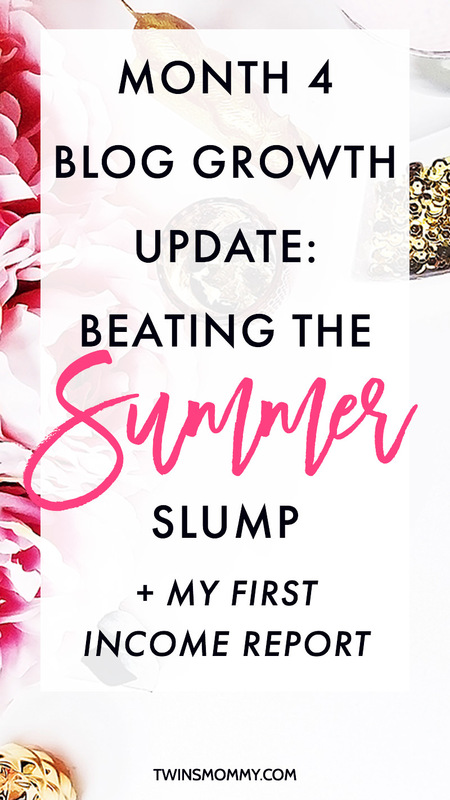 Tell me how you’re growing your blog through the summer slump. If you want to know how I did on Month 5 – check out my report! I have a quick question about the Mommy Vault – which I love and have downloaded all of the goodies inside – what membership plugin do you use? I had a quick look on the web and become confused FAST! Thanks so much! I am actually not using a plugin for my resource library. My husband is my developer and just coded it or something. But I’m sure there are some WordPress plugins that are similar to mine! Just not sure which ones? Thanks so much. I’m having so much fun growing my blog and finally having some income (well sort of!). Overall, its’ awesome. Great job on your Pinterest & e-mail list growth! Do you find filling your Twitter feed worth your time? I go back and forth with whether or not I should become more consistent on Twitter. Great question! I started using Twitter for my freelance writing and when I started Twins Mommy, instead of creating a new account, I started sharing my existing account. Everything is on auto pilot and I find since making it automated I have more retweets for sure. It’s not a big part of my strategy but I like Twitter b/c you can post multiple times a day. You are doing so well, it’s crazy! I am a little bit jealous haha 😉 I feel like I’m doing pretty well on Pinterest, but your traffic is bananas for such a new blog. I applied to a bunch more new group boards today, so I’m hoping that this will help! And I’m up to 100 pins/day now as well. Do you only do webinars with other mom bloggers? I’d love to collab for one sometime! Thanks so much! Love your blog and tips 🙂 Crossing my fingers you get into those groups! Awesome that you’re up to 100 pins a day. As I mentioned, I’m not sure if I can sustain over 200 pins a day. I don’t want Pinterest to penalize me! So I’ll probably drop to 100 or 150 after the summer? I don’t know. As for webinars, I mostly collab with mamas but Kasey isn’t a mama so I’m pretty flexible! I have some lined up until the fall but will contact when I have some free time! So inspiring! My mom just started making money with her blog, it’s only a little, but it’s a start. Hoping to reach the same goal someday! Congrats on all of your success, I hope it only grows and grows! Thanks so much. Congrats on your mom making money from her blog! It’s exciting isn’t it? Thanks for stopping by! I love reading your updates Elna! You are doing great, I’d love to talk about teaming up on a webinar in the coming months! Oh, you want to do a webinar with me? Let me know chica! Would love to do one with you. At the moment they are all pitch-free! Instagram is one of my favorite mediums these days!! I do love my blog (duh) but I just love PICTURES so so much! haha! 🙂 And don’t feel badly about traffic dipping in July – June/July/part of Aug and December are DEAD months in the blog world! Yeah I know. The summer slump hits everyone online! It’s hard though, when you’re new to and you just want to keep on growing 🙂 Thanks for stopping by! Very cool to hear about your growth! Congrats on the wins too!!! Thanks so much. Glad you enjoyed my update on growing my blog! Wow, first income! I just posted my first income and traffic report, too. I just launched in July, so there’s nothing mind-blowing, but I want to establish the habit from the get-go and since I’m documenting my journey with building an affiliate review site, I figure it’s a good idea to share my stats from the beginning. Your growth is amazing and I’m totally borrowing some of your strategies – especially networking! I’ve been an “IMer” for years but blogging is a new thing for me and the community is amazing! I love getting to know other bloggers. 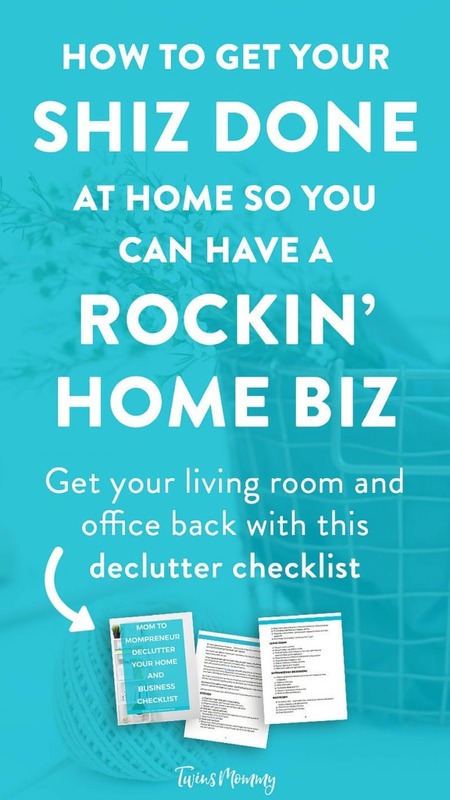 Killer opt-in freebie! Woo hoo! Oh, and I just signed up for the content upgrade webinar, so I’m really looking forward to that. Whoop! Thanks so much for signing up to the webinar! It’s my first EVER JOINT one and I’m looking forward to it. Just hoping my twins stay napping!!!! Thanks so much for the compliment. I feel my growth could be better, but doesn’t everyone think the grass is greener on the other side? 😛 Yes networking is what will help your blog consistently grow. It’s like the bloodline of your blog! Yes, I know I do that – look at the results of others and think, “I should be doing better.” But our journey is so unique to us. I’m looking forward to the webinar. I’ve never done a content upgrade (didn’t even know of such a thing until your blog!) Should be good fun! Well done Elna!! So proud of your accomplishment! It is so inspiring!! Thanks so much. Super happy my blog is growing month by month. It does take me a lot of time though so I need to find ways to cut that in half! Whoa, income! Not much but you must be psyched to have started. I am taking Michelle’s course Making Sense of Affiliate Marketing and upping my game there. I think it makes sense on my blog. Thanks for sharing, I love reading these posts! Thanks so much 🙂 Yes, I’m not entirely beating the summer slump, but I’m trying. Oh, and thanks! Yeah, I generated some income. Hehehe! I just signed up to be an affiliate for OptinMonster (since I am using them and L-O-V-E them) so we will see what comes of that! Thanks so much for the mention! And congrats on starting that monetization process! 🙂 It’s super exciting and I’m happy to have you on this wonderful team of mompreneurs! I am creating a special board on my Pinterest page to pin articles to whenever they mention my blog 🙂 And it’s getting a lot of your posts! So thank you so much! Thanks so much for your support! I absolutely love your blog and posts – they are super useful! Yeah, just dipping my toes into affiliate marketing and seeing where it will go! The Pinterest board for blog mentions is a great idea Suzi! Thanks so much! Boy oh boy, you do have your hands full 🙂 Yes, taking baby steps is totally doable. I totally agree with you about needing to diversify your traffic – you don’t want all your eggs in one basket. Thanks Cath. You’re blog is awesome too 🙂 I think I also mentioned you over on Elna Cain too. Spread the love you know! Superb growth Elna, l always look for your monthly blog growth updates. What makes it different from other blog updates is….. you share many tips, which are super helpful. I was not aware of Grum, was having a hard time posting on Instagram from my phone. Thanks for the tip!! Thanks so much for stopping by! Glad you found some good tips to help you beat your summer slump! There’s still another month so I’m crossing my fingers traffic doesn’t dip even more! Thanks for sharing all the dirty details of growing your blog, Elna 🙂 I love seeing how you track your GROWTH to your GOALS, so it’s not just “I got x amount of pageviews”, but instead, you have clear goals and a plan of attack to crush them. Smart mama! Thanks for the tip about Grum too! I think that’s one of the big reasons I haven’t paid much attention to Instagram – it’s always such a hassle to workaround only being able to post via my phone. Thanks! Yeah well having goals is important if you want to succeed right? Yeah, Grum is pretty neat. I like taking some time to schedule my Instagram posts and see how easy it is to grow my following!